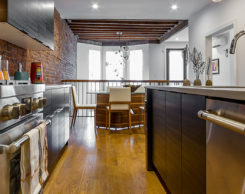 Prospect Place perfectly defines Brooklyn’s raw and urban design style. 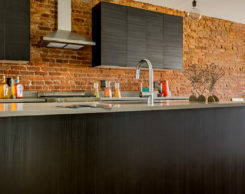 This rustic home features a parlour floor of exposed brick, a sleek black kitchen, and a double-height space that places this unique home in a category of its own. With vantage of the living room below this double-height space creates an amazing “wow” moment using a beautiful modern chandelier and steel railings around the perimeter. 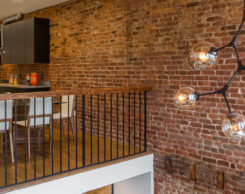 An adjacent wall showcases an accent feature designed specifically for storing bicycles, a common Brooklyn mode of transport. 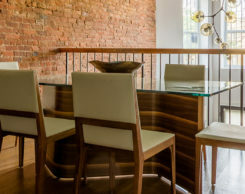 Prospect’s design flawlessly balances original detail with an updated industrial design, utilizing the home’s detailed original staircase in combination with a newly installed steel one. 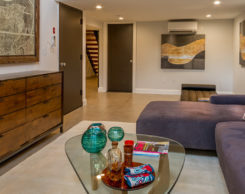 The basement floor is comprised of heated polished concrete that looks and feels beautiful while keeping with the rustic aesthetic. 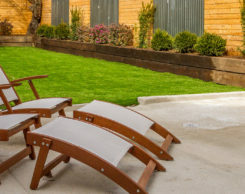 The backyard is no exception using an appealing mix of wood and metal, perfect to inspire barbeque conversations while enjoying this stunning outdoor space.